If you’re looking for a new staple dinner recipe, look no further. 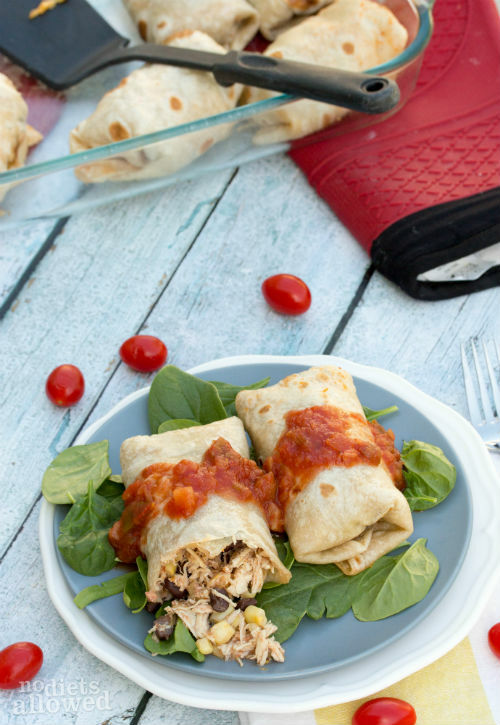 These baked chicken burritos are quick, easy, and have been devoured by people of all ages. They are my go-to recipe for busy nights and also when I have guests over for dinner. I’ve played around with 3 different options resulting in chicken perfectly tender and juicy. Depending on how far ahead you planned dinner, throw the chicken in a slow cooker, the oven, or a skillet (instructions in recipe). My personal favorite is the slow cooker. If you don’t own a slow cooker, I strongly suggest having at least one (I own two different sizes). 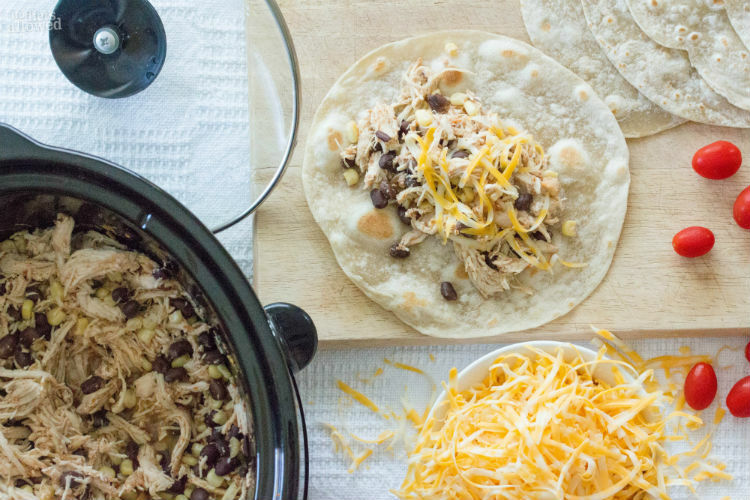 Get a 6-quart slow cooker so you can use it for small and larger recipes. 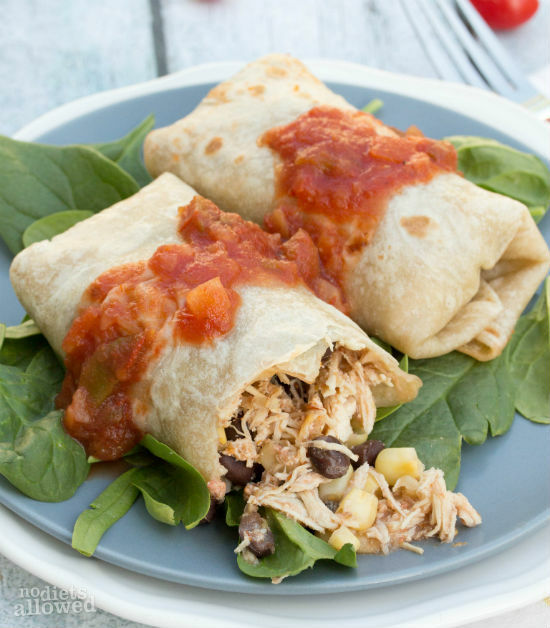 For these baked burritos, simply place the chicken breasts, salsa, onion, cumin, oregano, and jalapeno in the slow-cooker. Cook on high for 4 to 6 hours and viola! The chicken shreds incredibly easy and then you just stir in the black beans and corn until heated through. Raw tortillas. They will change your life! Okay, maybe a little dramatic, but you’ll never return to regular tortillas again. TortillaLand has become my favorite brand. They use basic ingredients and don’t use lard like some tortillas. 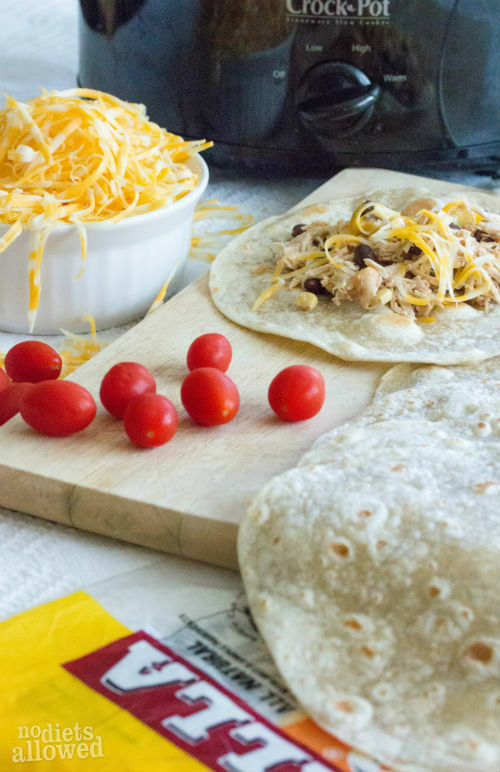 Their flour tortillas are perfect for these baked chicken burritos. Their corn tortillas also really compliment my Shrimp Tacos. You can purchase them at Costco, Kroger, Smiths, Walmart, or Amazon. There are 3 options for cooking chicken. 1st option: Place chicken breasts, salsa, onion, cumin, oregano, and jalapeno in slow-cooker. Cook on high for 4 to 6 hours until chicken can be easily shredded. Add black beans and corn for additional 15 to 30 minutes until warmed through. 2nd Option: Preheat oven to 400 F. Place chicken breasts, salsa, onion, cumin, oregano, and jalapeno in 9x13 baking dish. If chicken is thawed, bake for 25 to 30 minutes. If frozen, bake for 40 to 45 minutes until no longer pink and easily shredded. Add black beans and corn. Let sit until warmed through. Option 3: Cut thawed chicken breasts into 1 inch pieces. In a large skillet, simmer chicken pieces, salsa, onion, cumin, oregano, and jalapeno until heated through and most of the liquid evaporates. Add black beans and corn. Stir until heated through. Remove from heat. On a large pan, cook tortillas on medium heat until browned. Set aside. Place about 1/2 cup chicken mixture down the center of the tortilla and top with 2 Tbs of shredded cheese. Fold sides and then ends over to cover filling. Lightly spray 13x9x2 baking dish with cooking spray and place burrito seam face down. Serve with salsa/pico de gallo and 7 layer dip or Fresh Sweet Corn Salsa. 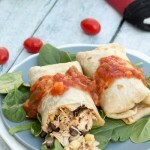 Brian says the baked burritos are his favorite of all the recipes I have made so far. I am sold by the fresh tortillas now. The fresh tortillas are the best! This is one of my husband’s favorites also. Thanks for giving me such great feedback, Christina!